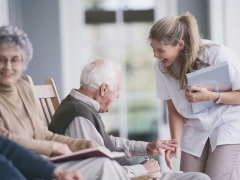 Is your organization interested in joining a community dedicated to improving resident care? RNAO will host a webinar on Oct. 4 about RNAO’s Best Practice Spotlight Organization (BPSO) program for long-term care homes. The webinar will focus on the process for becoming an LTC-BPSO including eligibility requirements and specific supports provided by RNAO. The BPSO program for long-term care homes assists homes in implementing and evaluating RNAO’s best practice guidelines over a formal three-year agreement. To learn more online, please go to the BPSO page. Request for proposals for LTC-BPSOs will be released near the end of September.